The market: Steve presents some amazing numbers … 15 Million iPads sold, 100 Million iPhones sold, 100 Million iBooks downloaded, 200 Million Accounts on the iTunes/AppStore/iBookStore with credit cards, $2 Billion payout to AppStore developers. 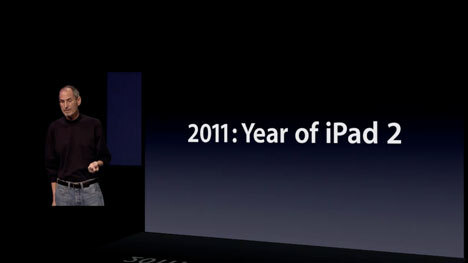 The iPad 2: Apple listened to their customers and integrated most of the features iPad users are demanding. But they also kept the prices and the battery life. The new A5 Dual-Core CPU is up to twice as fast and the graphics performance up to 9x. With the HDMI-cable accessory, it’s possible to mirror the iPad 2 screen to a flatscreen or beamer. This is perfect for live app demos and presentations. The iPad 2 is now equipped with a front and a rear camera. The new design of the iPad 2 and the magnetic covers speak for themselves. The design team of Jony Ive did a great job. The software: iOS 4.3 is shipping with a lot of improvements under the hood. By introducing iMovie and Garageband for the iPad Apple shows, that the iPad is not only a consuming device, but also a device to create things. But I only can recommend to watch Steve Jobs, Scott Forstall, Randy Ubillos and Xander Soren on the Quicktime streaming video yourself. Sorry PC-folks: The streaming video requires Safari 4 or 5 on Mac OS X Snow Leopard or Safari on iOS 3 or later.